Could soil analysis have helped increase your winter forage? You are here: Home / RADA latest news / Could soil analysis have helped increase your winter forage? Over the past two years our Farm Environmental Services advisors have collected over 300 soil samples for analysis. Standard laboratory analysis includes pH, Phosphorus (P), Potassium (K) and Magnesium (Mg). Analysis of these test results gives food for thought, especially when winter forage this year is under pressure. Over 35% of the tested grassland soils and 43% of arable soils were below the recommended pH of 6.0 for grassland and 6.5 for arable land. This is comparable to national figures which indicated that 29% of samples were below pH 6 (PAAG report 2016/17). pH is the main driver for productivity as it affects the availability of other essential nutrients (see figure 1 below). If pH is not optimal, yield will be reduced. 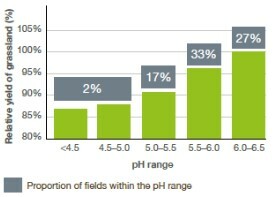 In Figure 2, the field with a pH of 5.0–5.5 will grow nearly 10 per cent less grass over the season than a field with the optimum pH level of 6.0–6.5. Figure 2: The relative yield of grassland fields with sub-optimal pH status and the proportion of grassland fields sampled within pH range. In the UK there are 5.2 million hectares of permanent pasture (pasture for five years or more) and 1.1 million hectares of temporary grassland (pasture for less than five years). If around 52% of this land is losing around 10% of yield due to poor pH management, this could equate to around 4.6 million tonnes od dry matter based on a target yield of 8 tonnes DM per ha. Phosphate is essential for root development which in turn is important for nutrient uptake, anchorage, drought tolerance and early season growth, it is also key to the survival of clover. 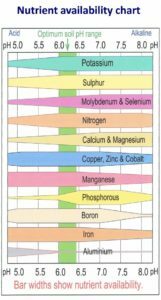 Potash is needed to transport nutrients around the plant, to produce protein and for the efficient uptake of nitrogen. 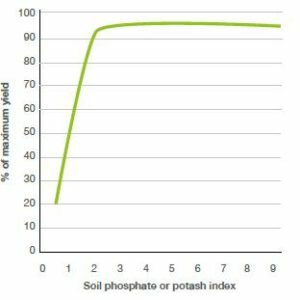 Typically the maximum yield of both arable crops and grass is reached at Index 2 for both phosphorus and potassium and your fertiliser policy should aim to maintain the soil at these indices. If soils are at the target indices you should aim to replace 8kg of phosphate and 27 kg of potash for every tonne of dry matter removed. Results indicate that only 30% of fields are at the correct P index and 40% at the correct K index. Where soils are below target indices applications above maintenance dressings should be applied to build soil reserves. Figure 3 indicates the impact of indices on maximum yield. However, care should be taken not to build the P indices of soils too high as this can have serious environmental impacts. Where soils are at index 3 or above phosphate can leach from soil into nearby drains and watercourses, causing eutrophication and algal blooms. 58% of our tested soils were above P index 2 and 25% were very high at index 4 or above. No inorganic P will be required on these fields and where possible applications of organic manures should be avoided. “Soil analysis results are not expensive, simple to collect and will have a big impact on your farm. The information is critical when planning your use of manures and fertilisers and it will help you to produce the right amount of high-quality grass while also helping you to protect the environment. It’s a win, win situation.” James Holmes, AHDB Senior Scientist. For more information on nutrient management for grassland and arable crops visit www.ahdb.org.uk/rb209.